You must signify that you agree before you can access your account. You must ALSO go into your security settings and change the new setting to allow export to stat's services. The default is NO. If you participate in Albert (their test project) you must go in and do likewise there. "Update: 2018-11-29 - The changes to the Web site have been rolled-out. The statistics export option will go in effect December 17th." I wonder what Einstein's stats will look like after this all kicks in? WOW....I can only assume the export data thing has kicked in as our team numbers on BOINCstats just shrunk dramatically! My guess is anyone who didn't change their settings to allow stat exports now no longer shows up on BOINCstats. https://boincstats.com/en/stats/5/user/list/0/0/73/#3 <---- I think that will work unless it's specific to my account? Yes I think the majority of users attch to a project and never change thir preferences again. It looks as if we are down to 29 users in Einstein. 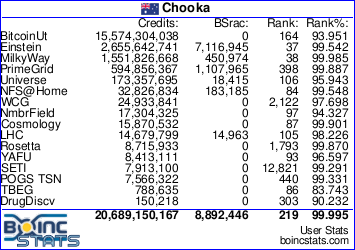 Acording to Formula BOINC our total credits were 5,254,430,782 yesterday and BoincStats has maintained the total, as of now anyway. Oh I didn't even think about Formula Boinc! Gee that will be interesting. @Dingo: Maybe create a subject about the issue in the news section. That way over time when team members drop by they'll hopefully see the news and change their settings accordingly. I guess you could also email team members? No good sending an email as I only get email address from those that tick the box. I tried to send a Team Message on Einstein but the web page is broken. I have put in a post on there Message Board about the problem. LHC only shows 2 users? Nothing's changed for me. I can still see all my rankings. Haha on WCG I've gained 213 places in one day. That will help my terrible global ranking! I got a reply from the Admins to basically say there is no way to send an email till it is fixed sometime next year. It is good thay the Admin did get back to me and I can see that there explanation looks feasible. I'm afraid something is broken (software bug) on our end. The problem is that the URL for generating a direct message (DM) uses people's IDs that are comma separated: e.g., userids=1,2,3,4,5, etc. With 1300+ users, that URL is just too long for the Web server to handle. In fact this "Send Private Message to Team members" functionality needs some attention. I'm sorry to say this won't be looked at into the new year. Until then I don't have a good solution for you. You can contact members individually by going to the Member list, clicking on a username, and sending message. Obviously its impractical to do this for your team.